Egg Description: A pair of golden wings is sprouting from this soft pink egg. Hatchling Description: Flying pigs are cute and cuddly when young, and they get along well with non-predatory companions of all types. Piglets can be a bit timid, and they're often clumsy and awkward, especially with their wings. They are unable to fly until they're fully grown, and their wings often get in their way. They eat a diet of leaves, roots, fruits, and flowers and are constantly growing larger. Adult Description: While their plump bodies might suggest otherwise, flying pigs are quite graceful in the air and can soar for days without tiring. They can reach quite a large size, although not big enough to ride. They lack the tusks of wild boars but have sharp hooves to use when cornered. Luckily, these sweet-natured pigs are more likely to flee than to fight and are typically not dangerous. The only exception occurs when they are defending their nests. Flying pigs only lay one egg at a time, as opposed to the six to twelve piglets found in a non-magical litter. They raise their young to adulthood before laying another egg. General Description: Unlike their wild boar cousins, flying pigs are friendly and have mild tempers, so they rarely stampede through things. These creatures are also very hardy, able to survive in extreme temperatures due to a thick layer of fat beneath their skin. 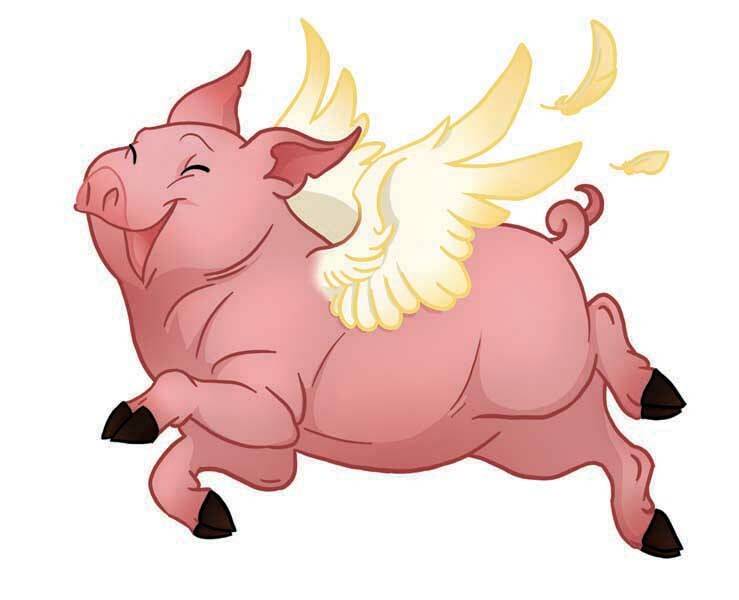 Flying pigs make popular pets among the nobles of Synara when small, but unfortunately, when well-fed, these creatures can reach the size of a cow, prompting their owners to release them into the wild. This has become a problem, since most tame pigs would rather feast on farmers' crops than find their own food in the woods. Sadly, they're often hunted for this reason, as well as for their meat, leather, and beautiful golden feathers. Magi everywhere strive to protect these kind creatures from the ignorance of the townspeople. Notes: Why don't we have flying pigs yet? Maybe for April Fool's Day? 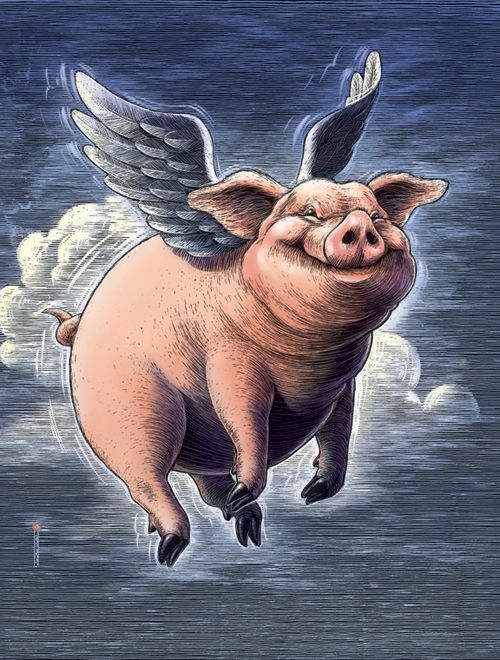 None of the images are mine and can be found by googling "flying pigs."